The day before we left Wisconsin my Fitbit stopped working. pushed back together the device couldn't function. I wore my Fitbit 24 hours a day for more than two years, so while I treated it well, I can't say its sudden death surprised me. I had grown quite attached to it, however, so when it kicked the bucket I felt both a little sad and a lot naked. My first instinct was to immediately purchase a replacement, but when I slowed down and considered my options with a clearer head (yes, I had to clear my head after my Fitbit died), I decided that asking around for recommendations before making a purchase would be a better course of action. I narrowed the seemingly endless number of available fitness trackers down to three - the kind I'd had previously along with two others liked by friends - but kept getting hung up on the fact that none of the three (or any I've found thus far) could do everything on my "want" list. So I made another decision...this time to not replace my Fitbit. At the risk of sounding dramatic, this decision rocked my world. Remember that I wore my Fitbit ALL OF THE TIME for more than two years. I moved it from my pajamas to my workout clothes to my regular clothes and back to my pajamas every day, checking it regularly to make sure I was on track to meet the day's step goal. Speaking of, my step goals have always been 12,000 steps on weekdays and 10,000 steps on weekends, and in 24+ months of wearing my Fitbit, I met my goal all but eight days. Knowing that, I decided I could go about my daily life - as long as I maintained my regular schedule of walking the kids to and from school, working out at the gym, and going for long walks on the weekend - and still meet those goals. I don't need a Fitbit to tell me I reached 10,000 steps, or that I walked across Japan. 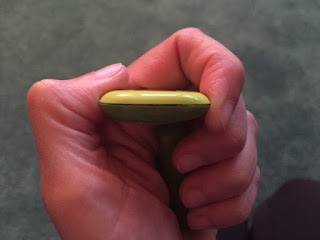 I still reach for my Fitbit multiple times a day, wondering for a split second when I don't feel it clipped to my clothing where I might have taken it off and left it. But with each passing hour, I feel a little less constrained...a little more free. So RIP, my jolly green giant. You served me well as both a companion and a coach, but the time has come for me to make a go of it on my own. I could use a little more freedom in my life. in the shower, and once he managed to accumulate 100 steps for me.